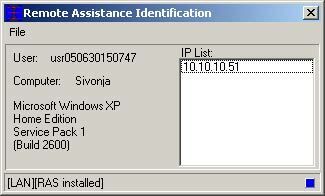 Remote Assistance Identification is a VNC remote desktop addon tool which helps you find out if your remote computers are online and their IP addresses if are dynamic. VNC remote admin software lacks the feature of monitoring remote computers online status. If someone asks your help via VNC, you have to know if he is online, what is his IP, if he is behind NAT or firewall etc. RAI helps you, by gathering all that info and providing it to you at the moment a remote client gets online.